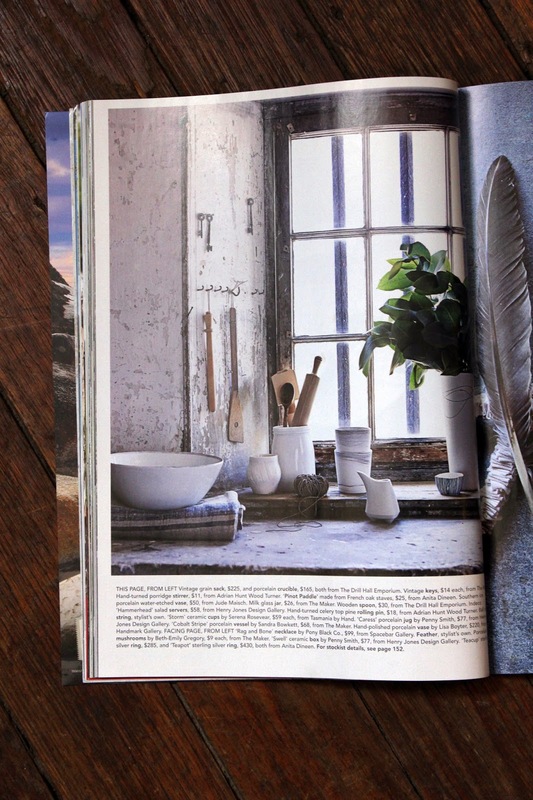 The Drill Hall Emporium: the Drill Hall Emporium's goodies in Country Style magazine! 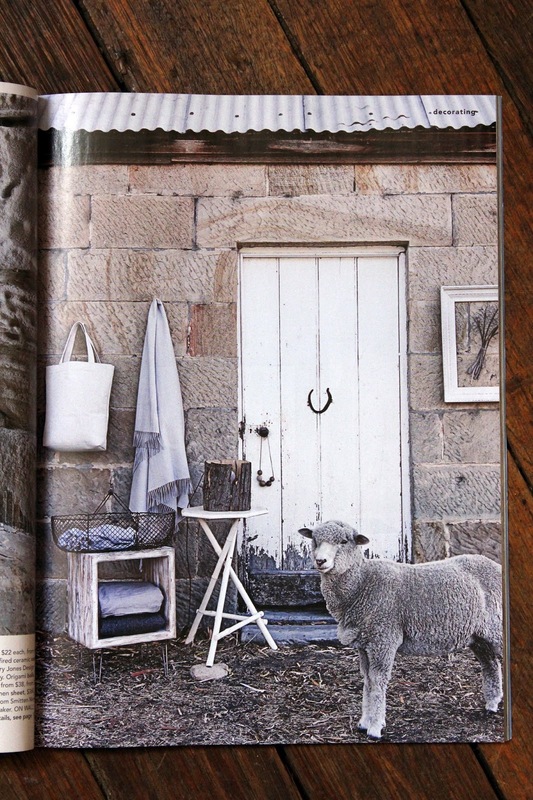 the Drill Hall Emporium's goodies in Country Style magazine! 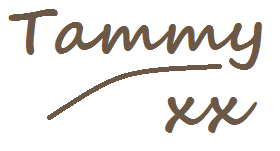 I have made no secret over the years writing this blog that I love Country Style magazine. It is truly one of those magazines that make you feel like making yourself a cuppa and settling down to devour the whole issue cover to cover. The March issue is no exception to this rule, rating up there as one of my all time favourites. 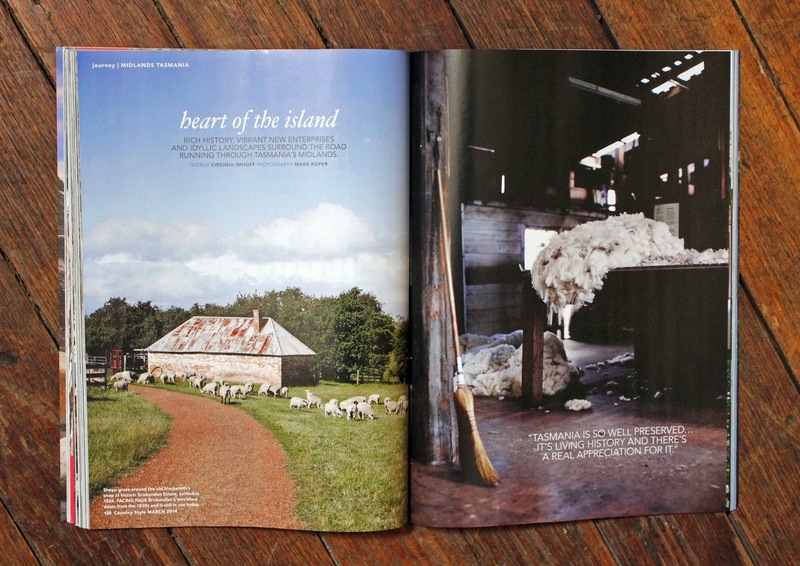 The March issue is based almost entirely on Tasmania, and is named the Tasmanian issue "Island Dreaming". 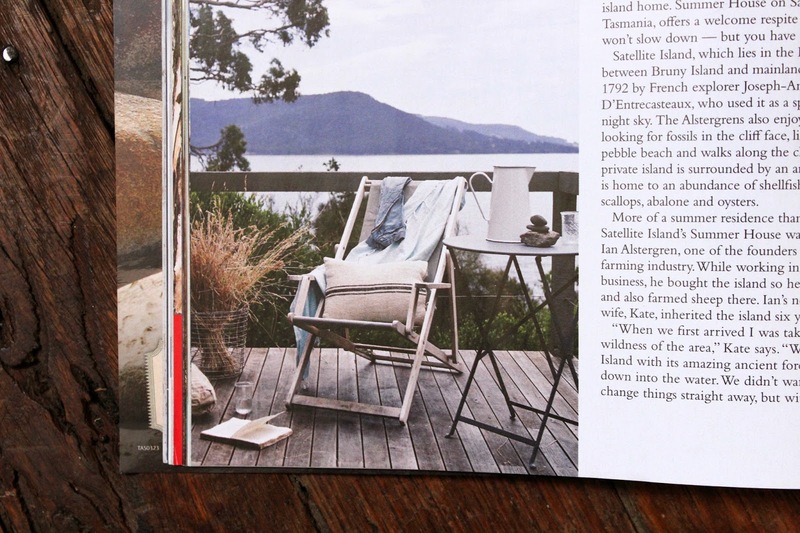 The decorating pages are filled with Tasmanian only products including pieces from our very own Drill Hall Emporium. Our orchard ladder looks right at home against this sandstone wall, above. And our 19th century chaise longue doesn't look too shabby, either. No actually, it is meant to be shabby. It suits perfectly! 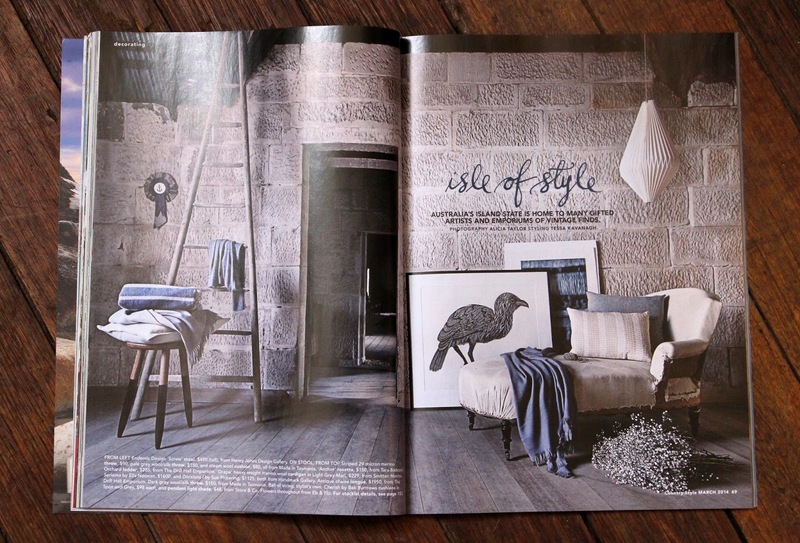 Tessa Kavanagh, Melbourne stylist with a unbeatable eye, was responsible for putting these decorating pages together. 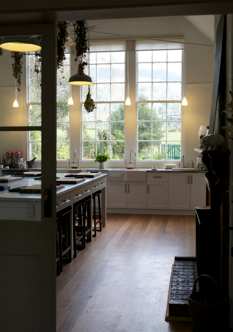 She sourced and assembled a beautiful mix of Tasmanian art, woollen blankets, wooden spoons and handmade porcelain pieces among other uniquely Tasmanian products. She showed how much Tasmanian has so much to offer in terms of quality materials, the handmade and the unique. Another feature in the March issue is the privately owned Satellite Island upon which sits the most stylish beach (or should I say island?) home. In fact, you can book to stay on the island when the family are based in Melbourne. The perfect hideaway! Some of the pieces including the jars, cafe chairs and trestle table, above, were originally bought from our store. 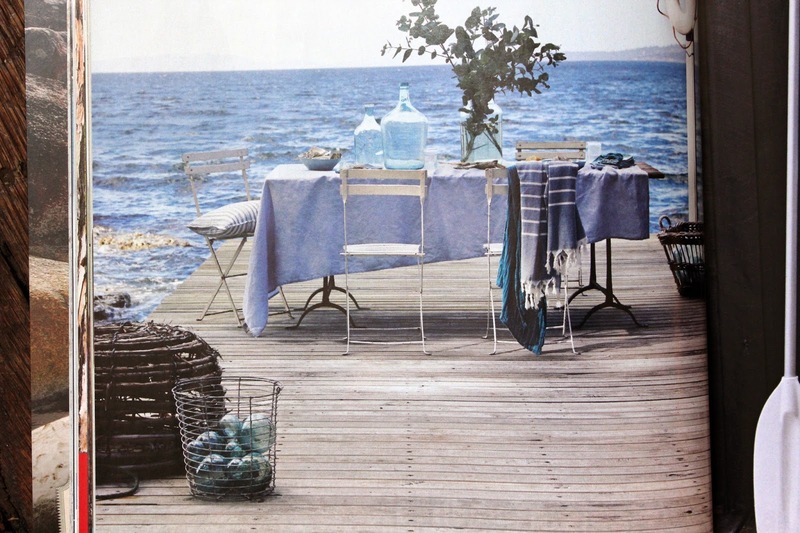 Who else would love to have a seafood lunch on this deck? And I would really love to read a book at this setting! Notice the blue striped grain sack cushion? Mum will be happy to see that the owners have put it to good use... To see more on Satellite Island visit their website. If you are planning a visit to Tasmania the March issue also plans out an itinerary starting in Launceston and heading south through the Midlands and on to the Derwent Valley. You could base most of you holiday on these few pages alone - where to stay, where to eat and what to do. 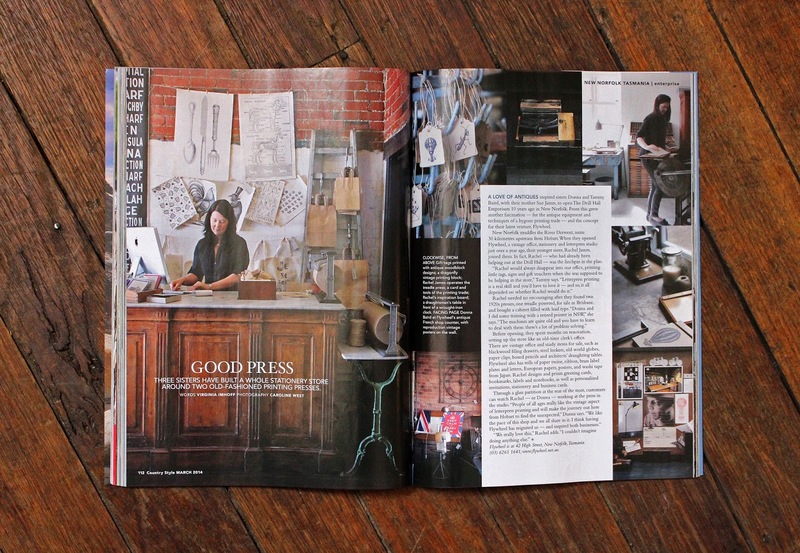 And most excitingly, Flywheel, our sister store to The Drill Hall Emporium, is featured over two fantastic pages. The article tells how and why we started Flywheel and shows some pictures around the store, including a shot of Rachel working the c.1915 Arab platen press! Congratulations !!! ...happy day love Ria...x ! What a wonderful issue! 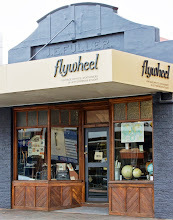 Congratulations to Flywheel. 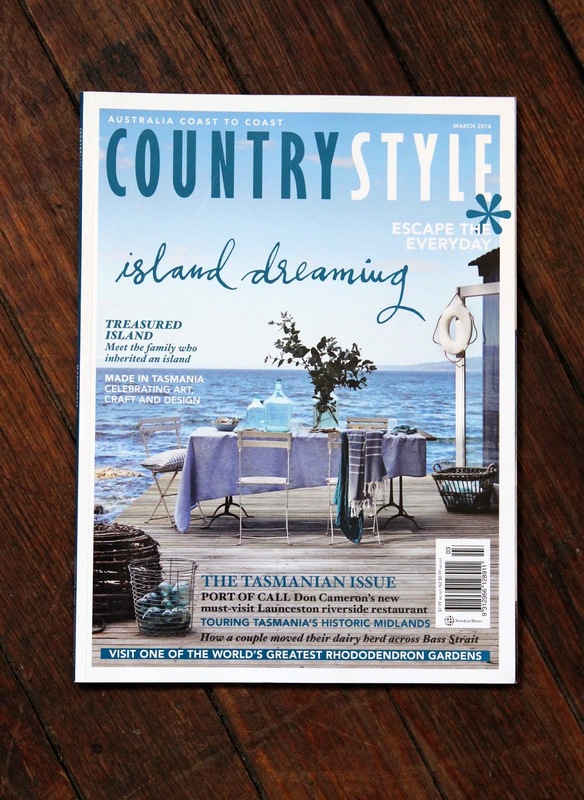 I was in the Newsagency today and couldn't find any copies of Country Style so I will have to further my search. Sometimes, even us locals can do with a helping hand to see what other amazing things are in our state! Enjoy the rest of the week, it's flying by so fast. I am now also up and running with a new hard-drive and trying to get used to Windows 8!! My daughter is relieved I am not ambushing her for her laptop. I think I'm worse than the kids! You are absolutely right, we don't appreciate what is right on our own doorsteps sometimes! I am trying to make an effort to do more and see more right here in Tassie. I hope you can find a copy of the March issue! And I am so pleased that you are sorting your computer issues out, there is nothing more frustrating!